We must be very careful when we give advice to younger people; sometimes they follow it! I just started a new job at a company that you’ve heard of, and one of the delights is being introduced to fun bits of corporate vernacular. I’ll have to post about that soon. (Update:: done.) In the meantime, tho, there are some Friday words to take care of. The first term came up in a discussion about a slightly odd news story: the car manufacturer Mazda has pioneered a way to make more-efficient gasoline engines. Great news, right? We'll use less gas that way. During discussion, FB Friend Jim observed that increased fuel efficiency can have a rebound effect that is known as Jevons Paradox (no apostrophe). Jevons was an English dude who observed that if the price of coal went down, people would just use more of it. More generally, increased efficiency in using a scarce resource leads not to the resource lasting longer, say, but to greater consumption of that resource. Writing in a fascinating New Yorker article ("The Efficiency Dilemma"), David Owen uses several examples; the one I liked pertained to air conditioning. When Owen was a kid, AC was rare and pretty energy-expensive. Manufacturers made AC more efficient, but it's led to an explosion in the use of AC, leading to much more energy overall being devoted to cooling down air. I did warn you that this was a geeky week. As a bonus (still geeky), here's a fun technical term I learned just a few hours ago: cryptographic deletion. There can be times when physically deleting a digital file is impractical, such as when there are many copies of the file scattered around. But if the file was encrypted, you can "delete" it—that is, make it inaccessible—by permanently deleting the key that was used to encrypt the file in the first place. Although cryptographic deletion can be practical for home users, it's really something more for, say, cloud providers. Up through the 1700s, the tabletop abacus or counting board was widespread in Europe. Shopkeepers traditionally faced their customers across the device as they added up purchases. 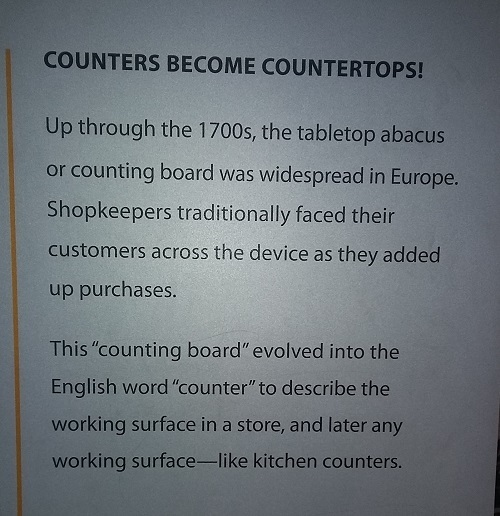 This “counting board” evolved into the English word “counter” to describe the working surface in a store, and later any working surface—like kitchen counters. Since one does not necessarily want to take the word of a museum exhibit on etymological matters, I double-checked when I got home. But they were right. In fact, not only was the museum's explanation correct, but it was a clearer and more thorough story than what I might otherwise have extrapolated from other sources. I am sorry that I doubted the research and writing skillz of the anonymous exhibit-placard writer.